Remote Access - secure access your files and media via mydlink.com and the mobile mydlink app. ShareCenter devices connect directly to your home network, delivering storage and sharing solutions to all your connected devices. That means while you're backing up work documents from your laptop, the rest of the family can stream stored photos, music, and movies to their tablet or smartphone. And with simple yet powerful privacy settings, you'll have total control over file access and distribution. Now that you've backed up your favorite music, photos and movies, wouldn't it be great if you could stream and share them to all of the devices you already own? With ShareCenter, you can. 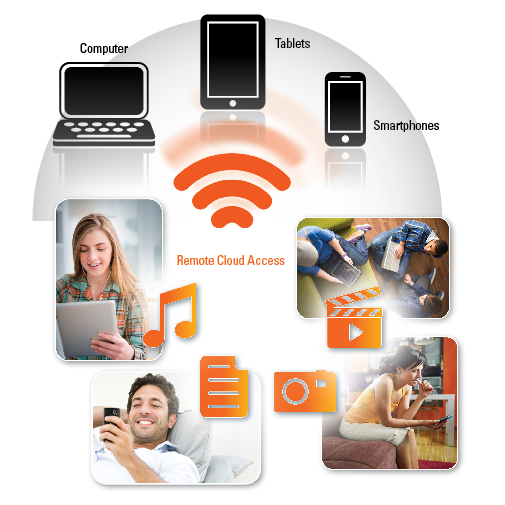 ShareCenter makes it easy to wirelessly stream digital media to your entertainment systems and mobile devices. Keep your digital world at your fingertips with ShareCenter. ShareCenter solutions combine feature-rich customization options with the ease of use you've come to expect from D-Link. With the included software, users can quickly and easily create schedules for real-time, full or incremental backups, while also setting storage quotas for specific users and groups. ShareCenter offers robust content management without the hassle.